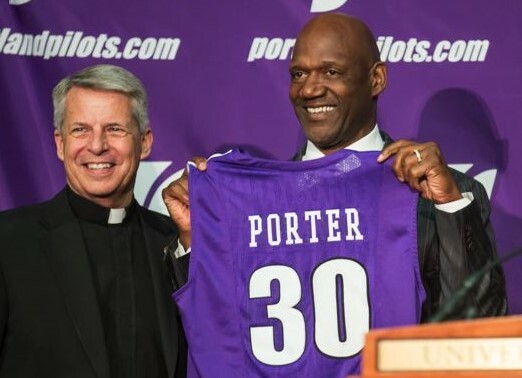 Live stream of the Coach Terry Porter Press Conference! For those who cannot make today's noon press conference in person, the U has posted a link to a live stream of the event! Re: Live stream of the Coach Terry Porter Press Conference! Highlights from today's presser? Wasn't able to tune in. Missed the conference. But just heard Terry on Canzano's radio show. Yeah, he said WCCC two or three times. Had to correct from WAC once. Dean Murdoch wrote: Highlights from today's presser? Wasn't able to tune in. Good crowd. A few hundred easily. Saw lots of alumni and season ticket holder folks, as well as plenty of university faculty/staff and even a decent amount of students. Lots of media. I think every major TV station was there, and radio stations, The Oregonian, Dwight Jaynes, etc. Got a very genuine feel from Coach Porter - he seems excited about the opportunity, and it really does seem like a right time, right place kind of thing. He said he had enjoyed the last few years of spending more time with his sons, but with his youngest about to graduate HS, he felt like it was the right time to get back into coaching. He said he wants to play up-tempo, and I believe he said something along the lines of giving the players the freedom to run and follow their basketball instincts out on the court. This may end up being a big difference from Reveno's era, as he typically used a more tightly-controlled system. Mike Burns confirmed as an assistant. He said he wants to "own" the Portland area and the Northwest in terms of recruiting. I also heard him say, in the media scrum afterward, that he really wants local players to know that UP is here and that we want them. But he also said he will use his extensive network to recruit players from all over the country when those opportunities arise. He said he's planning on reaching out to a lot of alumni as well as former players - he said he was meeting with Pooh Jeter on Thursday. Fans had a chance to do a meet-and-greet in the HOF Room after the media scrum. I think what impresses me most is he really wants to be a part of the UP community, and he already has a deep affinity for the place and its people. That's awesome. Gotta figure a guy like that is set financially and hopefully has pretty pure motives as a coach. pilotram wrote: That's awesome. Gotta figure a guy like that is set financially and hopefully has pretty pure motives as a coach. Haha, yeah when I mentioned to both TP and Susie that both their sons could come to UP and not count against the 13 scholarships if they paid for their sons' education, they each gave me a quizzical look like, "what?" Interesting, that is the exactly what the Army and Air Force ROTC leaders at UP expect from their student-cadets!